Got lots of Winter photos you want to share or scrapbook? Why not consider the Memories and More Color Theory card pack? I created this fabulous layout using the winter themed cards in this fabulous card pack! Although this layout is winter themed, the card pack provides options for all seasons! 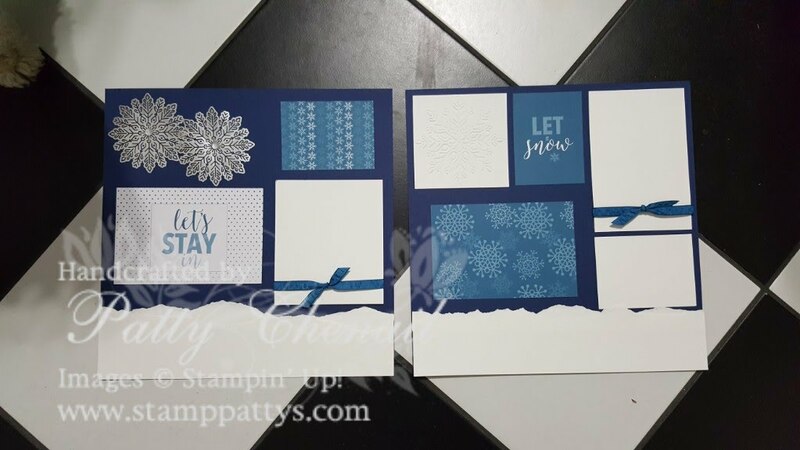 Using two sheets of 12 x 12 Night of Navy cardstock, two 2″ x 12″ pieces of whisper white, 4 of the cards from the Color Theory Memories and More Card Pack and one sheet of 8-1/2″ x 11″ whisper white cardstock, I created this two-page spread! I added two of the silver foil snowflakes and some retired dapper denim ribbon! To make the bottom border look like snow, I tore the edges and added the clear wink of stella to make is shimmer and sparkle like fresh snow! While digital scrapbooking is fun and simple, my customers still prefer the tactile look and feel of traditional scrapbooking! These memories and more card packs make creating traditional pages a snap! I hold a class on the second Monday of each month. If you are interested in joining this group, email or message me today! Below is a complete supply list! Click on the items you want to purchase and you can order 24/7 through my online store!